Have you heard of Georgia Pellegrini? She's a chef, hunter, DIY maven, author, and all around cool chick... and I recently got the chance to sit down and ask her a few questions! Georgia is an Ivy League grad who traded in her job on Wall Street to become a chef in some of the world's most renowned restaurants. Her foray into food led her on a journey back to her roots and an exploration of where food comes from and a modern approach to farm-to-table cooking. Her mission and message is all about self sufficiency, being resourceful, and living off the land-- no matter where you live. In 2011 she started spreading this message to the masses when she released her first book Girl Hunter: Revolutionizing the Way We Eat, One Hunt at a Time. In it, Georgia explores the true meaning of 'farm-to-table,' in a collection of essays detailing her hunting journeys and the meals that they inevitably yielded. Additionally, she has recently released her second book Modern Pioneering, which is essentially a handbook for the self sufficient lifestyle that she's so passionate about both teaching and living. The book is filled with a variety of recipes, gardening ideas, craft projects, upcycling ideas, and tons of other tips, projects, and ideas intended to inspire the reader to roll up her sleeves, get her hands dirty, and to be resourceful-- no matter who she is or where she lives! There are so many cool ideas in this book from the simple (turning leftover wine into popsicles) to the clever (growing potatoes in a garbage bag) to old school pioneering (building your own lean to structure!). I've been dog-earing page upon page of my copy... I can't wait to try them all! 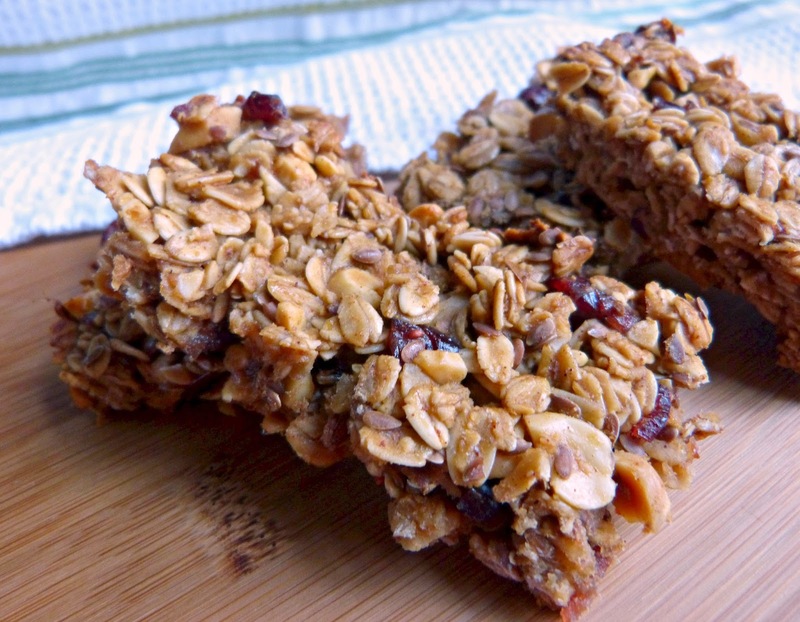 In fact, I got a headstart this past weekend and gave Georgia's granola bar recipe a try. Because of my husband's allergy, I had to sub peanuts and peanut butter for her almonds and almond butter but he ate three of them that day so I think that's a testament to their tastiness! In addition to Georgia's busy life as an author, she also regularly hosts Women's Adventure Getaways. On these weekend trips, attendees get to truly live and learn Georgia's Modern Pioneering ways. She'll teach you some new life skills like how to hunt, fish, and clean your kill and you'll hike, cook, and enjoy fireside chats with Georgia in gorgeous rustic locations. In fact, she'll be in my neck of the woods this week at one of my new favorite places, the incredibly rustic and beautiful American Club Resort in Kohler, Wisconsin for a "Kohler Adventure Getaway Weekend." If you're in the area and you'd like to attend, be sure to register here! 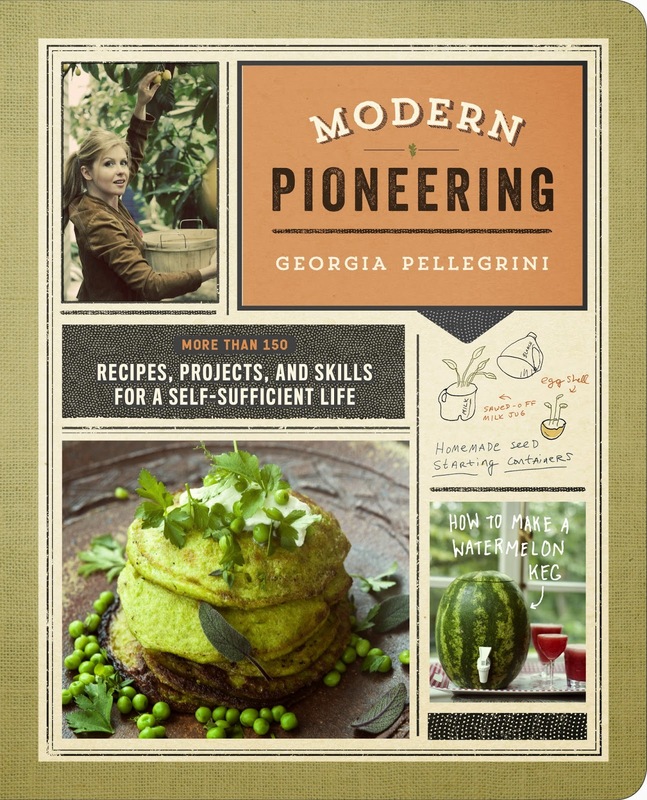 And now I'd like to introduce you to Chef Georgia Pellegrini in her own words. Check out our interview below and be sure to check out Modern Pioneering! AC: In your own words, can you tell us a little bit about your new book Modern Pioneering and where the idea came from? GP: I have been teaching what I call 'manual literacy' in some form, for the past several years. It started with my Women's Adventure Getaways that I do and at those Adventure Getaways I teach women to fly fish and clay shoot and cook and hunt and clean their own animals and really be hands on and so Modern Pioneering was an opportunity for me to teach people ways to get back to the land and use their hands again even if the land was a patio planter or a fire escape where they were growing vegetables in a pot or a garbage bag. And so the idea being that we can all access those values of our grandparents' generation even in our modern busy lives. It's sort of a road map for people to get there in small ways when they just have 15 minutes on the weekend or in bigger ways when they have more time. It's really just a way to broaden people's access to using their hands again. AC: You have an interesting background where you went from working on Wall Street to becoming a chef to investigating where your food comes from-- What inspired you to make that transition? GP: I think I just wanted to get back to my roots again and to get back in touch with what I had grown up doing. For me, there is something really satisfying about manual labor. We spend so much time on computers and on cell phones and trolling the internet for life now that disconnecting from that and doing things that are tangible and physical and have a really clear result-- it's something that I think human beings need and I think that we've kind of gotten away from that a little bit. I was trying to find ways for people to get back to that in a context that could still work for this reality of our lives, which is that they are all going to be technology-driven. And that's never going to change and my goal is not to change that-- and I'm not saying that suddenly everyone needs to become a prepper and a homesteader and to go buy a bunch of land-- but it's about finding ways to make all of this really accessible for our current lives. AC: I'm a city girl with a little deck and some limited sunlight, what are the best (edible) plants for me to try to grow there this summer? I have killed many herbs over the past few years! GP: That's one of the great things about the book, actually. It has a really large gardening section for small space urban gardening and it gives all of these really cool lists of things that are easy to grow based on different circumstances and also a lot of common problems and how to overcome them. I always tell people to start with very simple things that are really easy to grow and I literally have a list that's called "The Easiest Fruits & Vegetables to Grow." I always say that radishes are wonderful. There's a great recipe for Buttered Radishes in the book and they're really quite simple to grow and you can grow them in pots or planters or windowboxes. That's one of my favorites. Leafy greens are really nice and easy. Swiss chard is really durable and it can handle colder temperatures-- the same with kale. Even tomatoes, actually, aren't that difficult. They just need a lot of sun and heat. Also potatoes. GP: Yes, you can grow potatoes in a garbage bag full of dirt on your fire escape. You can get 25 lbs. out of just a few spuds. And they're the kind of thing that you can store in your cabinets for months. And you can even create the spuds that you need to grow from an existing potato if you let it sprout as long as it is organic. Then you can let it sprout and use that to grow new potatoes. There are just ways to be efficient and economical about it. You know, it's not as hard as it may seem. AC: What is one of your 'go to' recipes-- either something that's really comforting to you or something you might serve to guests? GP: I'm known as "The Meat Girl." I cook a lot of meat and I love pure ingredients that can speak for themselves. I love vegetables that are just simply served. When I cook for my friends or even just myself it's not just about what you see on the plate and how it tastes, but the visual experience of it-- the textures, the colors. I'm a big fan of putting flowers in my food that are edible, which you'll see a lot of in the book. So, what I usually serve people are really pure simple ingredients: a piece of lamb or-- I hunt a lot, so pheasants or I'll do a wild hog. I love pig, in general. I love smoking it, and barbecuing it, and braising. I love stews-- they're very comforting, especially in the colder months that don't seem to want to end these days. And vegetables, I just love beautiful green salads and nasturtium flowers scattered in there. And there's something really beautiful about stuffed squash blossoms or a simple buttered radish as a snack. I just that it is the purest and cleanest way to be eating. And physically, you get the most energy from that kind of food. AC: Do you have a favorite or least favorite ingredient to cook with? GP: I love fat, so I cook with a lot of coconut oil or butter or grapeseed oil. I just really like fat. That's probably my favorite ingredient. I love leaf lard, which comes from the lining in the stomach of pigs and it makes this amazing flaky pie crust-- the best that you can make. And for what I don't cook a lot with-- and not to sound cliche-- but I almost never cook with any kind of sugar. That was something that my grandmother and my great aunt used to teach me: If you ever see sugar in a recipe, you can cut it down by more than half and it'll still taste sweet, but you'll actually taste the other flavors more and it will bring out the flavors of the recipe even further by not overwhelming them with sugar. So that's something that I always do when I see a recipe for a dessert. I usually substitute honey or agave or sometimes I'll use raw sugar, but I always cut it to about 1/3 of what the recipe's asking for and the recipe tastes so good. And I always throw in a dash of salt too. The French do that a lot and I think when things have a bit of saltiness it brings out the flavor more as well. AC: You are passionate about getting your hands dirty with DIY projects and farm-to-table cooking, but what do you do when you want to treat yourself? Or what's your guilty pleasure? GP: I'm a big introvert so I love being at home because I never get to be at home. It's such a pleasure for me to be home and be on my couch and light candles. I love candles-- I have a thing for candles-- and there's actually something in my book for how to make your own beeswax candles. Everything thing in my book is literally in my house. I live that life and so I light one of my beeswax candles and make myself a delicious arugula salad with nasturtium flowers and I'll listen to my record player. Sometimes I'll have friends over. I love bubble baths. I feel like there's nothing like that for relaxation. For me, just being home is such a pleasure. It seems too simple, but I don't have this bucket list of places that I want to travel to. I have this desire to be in my own home and my own bed. I love my home because I have made it a real home for myself. AC: My husband was leafing through your book last night and decided that 30-minute mozzarella and dandelion wine both caught his attention right away. What do you think-- can we handle them? GP: Oh my gosh, yes! The mozzarella is really wonderful. The key there though, is making sure you get the right milk. So much of our milk is pasteurized to the point of changing its molecular structure, so it's just about finding milk that's as unadulterated as possible. Every state has different rules and raw milk is the best possible answer and there are stores like Whole Foods that sell brands of milk that have not been ultra pasteurized... You can also go to health food stores and sometimes they'll have something that's a little bit more raw. Once you find that, you're set. Everything else is super straightforward. And then for dandelion wine, it will last forever, although it is best when you drink it within six months. My godfather actually taught my about putting it on a roasting chicken and it gives the chicken this amazing crispy, caramelized, sweet outer crust and it is pretty phenomenal. AC: You have this Adventure Getaway coming up at the American Club in Kohler (a gorgeous place!). What you do you hope that women who attend will take away from it? GP: I want them to surprise themselves, in terms of doing things they've never done before or doing things that they never thought they'd do or thought they couldn't do. I think so many women tend to self edit and they think that if they weren't born doing something then they can't try it because they won't be perfect at it the first time... I'm all about encouraging people-- especially women-- to be more fearless and to try things that scare them and to get outside their comfort zone because I think that's a more visceral way to live. It's a great environment because they support each other so much in these experiences and they're allowed to laugh and they're allowed to fail and not take themselves too seriously. Ultimately, it's amazing to see how they change and grow over the course of a weekend. I had someone leave and say "I feel taller after this weekend" or someone else described it as their "unraveling" that's what my goal is: to give women this experience where they are truly unraveling and they're stepping outside their comfort zone. I think once you allow yourself to do that, it becomes addictive. You are constantly exploring those opportunities without abandon and living life more fearlessly as a result. AC: Of all of the skills, recipes, and projects that you cover in Modern Pioneering, which 2 do you think are the most important for self-sufficient city girls like me to know about? GP: I think that it's more conceptual skills that a lot of them represent: encouraging you to think more creatively about what you have on hand in your kitchen. For example, the fact that you can upcycle so much instead of throw it out. It's the idea of cooking with an economy in mind, so one example would be taking the peel from our citrus that we often toss after we get the juice and tossing them into a mason jar instead, covering it with oil, and making lemon oil and incorporating it into a salad dressing. You're squeezing more value out of what you already have. Or the idea that you can take some leftover tomato tins or coffee tins and use them as a really fun cool looking containers for growing herbs on your windowsills. Taking your glass beer bottles or wine bottles and turning them into glassware and the idea that we can do more with less and still be really satisfied. That would be one more conceptual thing that I would encourage people to think more about. I think also just the gardening aspect of thinking about your space differently and that even if you live in a box of an apartment, it doesn't mean that you can't use your hands. Whether it is growing on a windowsill, a fire escape, in a back alley or whether it is being a guerilla gardener and cruising down the street and throwing seed bombs out of your window into abandoned parking lots, there are ways that you can approach this with fun and be more interactive with nature. Thanks so much for your time, Georgia!